Written by Janet Choi on July 30, 2015 . Are you ever convinced by those winback emails that lament “We miss you!”? That particular sentence makes me cringe. There’s the misplaced focus on the business, dismissing whether I’m missing anything or not. 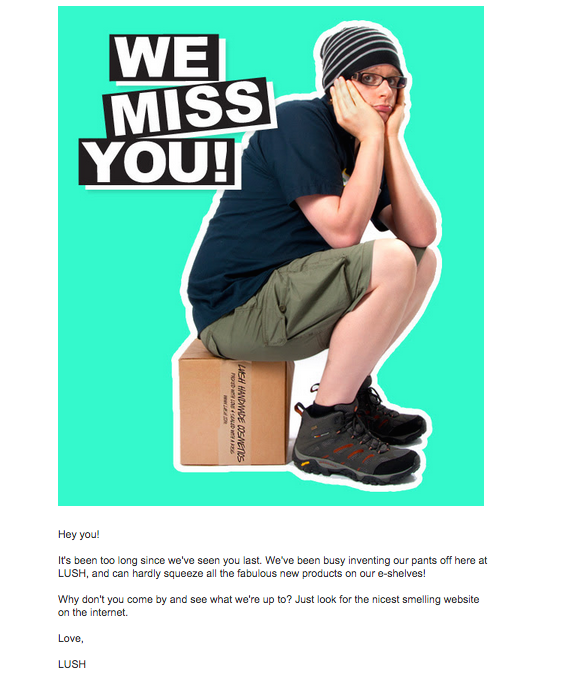 Plus, somehow the wording always prompts the thought that it’s not really me that they miss but my money. Winback emails aim to reactivate former users and customers, but they often miss the mark because they fail to connect with and feel relevant to its recipients. It’s an awkward stage — you’re reaching out to people who have recently shown that they might not like you or want to stick around. But that’s no reason to discard those relationships or risk throwing away value and trust that you worked hard to build along the way. So how do you get back in touch without coming off as selfish or desperate? You have to think about who you’re trying to motivate and what’s in it for them. And when it comes to reengaging trial users for SaaS and subscription businesses, that isn’t always easy. 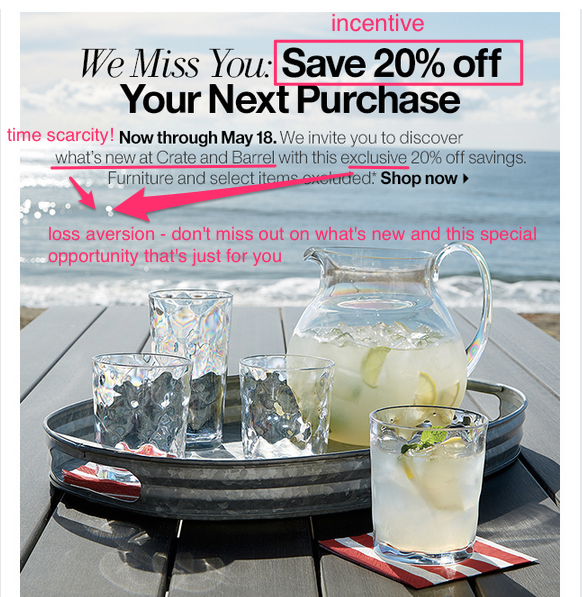 Take this winback email from Crate & Barrel, which combines these elements: 20% discount + limited time offer + don’t miss out on our great new things The photo featuring seasonal, summery products on the beach also helps make the message more relevant to shoppers. Click for full email All winback emails should contain a strong incentive for the reader. But the most common method of offering a discount or special deal isn’t always a great fit for SaaS or subscription-based businesses, since folks aren’t making one-time purchases here and there. Attempting to summon loss aversion by talking up features and benefits can also be misguided, given the timing. The prospect of loss isn’t going to work as a motivator when people have recently decided that they’re okay with the actual loss. What’s left? You can offer one-time deals down the road or wait for a big product or company announcement to try to reengage people. But what if you’re months away from the next big feature set or don’t have anything new to show off? Customer.io email timing setup Luke created a reengagement campaign, automating a series of 5 emails for people who’d gone through a 15Five trial without converting. They received the first email 4 weeks after their trial period ended, and an email every two weeks thereafter until the 12th week. Luke started by sending some manual emails before setting up the drip series. “This allowed us to measure the effectiveness of the campaigns before automating drip emails,” says Luke. For example, he tried targeting trial users who hadn’t converted over a six-month period to get the timing right before settling on the 4-to-12 week window. Here are a few things to keep in mind when creating soft winback campaigns for your lost trial users. How long has it been since you’ve been in touch? If too much time has gone by, you risk spam complaints and annoying people who don’t remember who you are in the first place. Generally, 6 months is probably as far back as you want to go — but do some manual testing to feel out the effectiveness of your timing. 2. Get the segment right and preach to your choir. 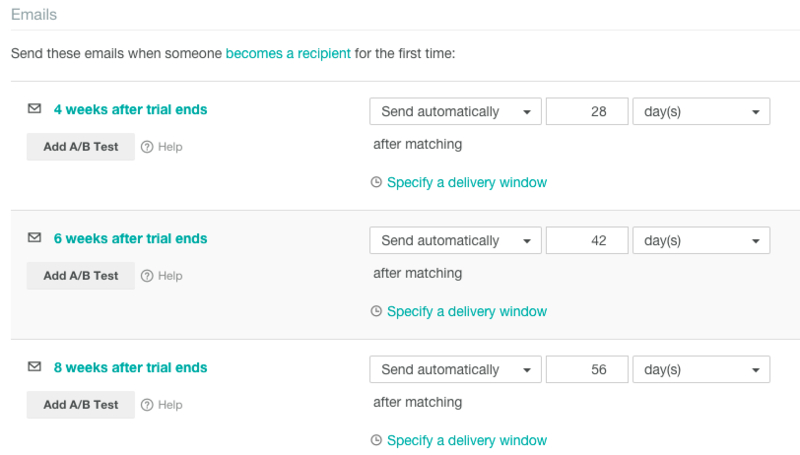 First of all, make sure you’ve segmented your recipients correctly so that people aren’t mistakenly getting messages that mention that it’s been awhile. You’re targeting a very particular group of people who are somewhat but not very familiar about you. So don’t treat them like strangers, and don’t forget that you have some data and insight about this particular audience because of their initial trial interest. What topics are they interested in? What goals do they have? What would encourage people to stay in touch with a company whose product they’ve tried and didn’t continue using? Also consider segmenting recipients into narrower slices based on their actual engagement with your product. You could have different campaigns or strategies depending on people’s engagement level during their trial period. It may be smarter to target people who tried a few features over the trial period or completed an activation goal rather than those who signed up, never tried anything, and never came back. 3. Build a series of emails. According to research from ReturnPath, sending multiple win-back messages was more effective than only sending one. They found that while people may not read the initial email, 45% of them read subsequent messages. ReturnPath’s study focused on retailers, but the effectiveness of email series aiming towards a single goal applies to other types of businesses as well. 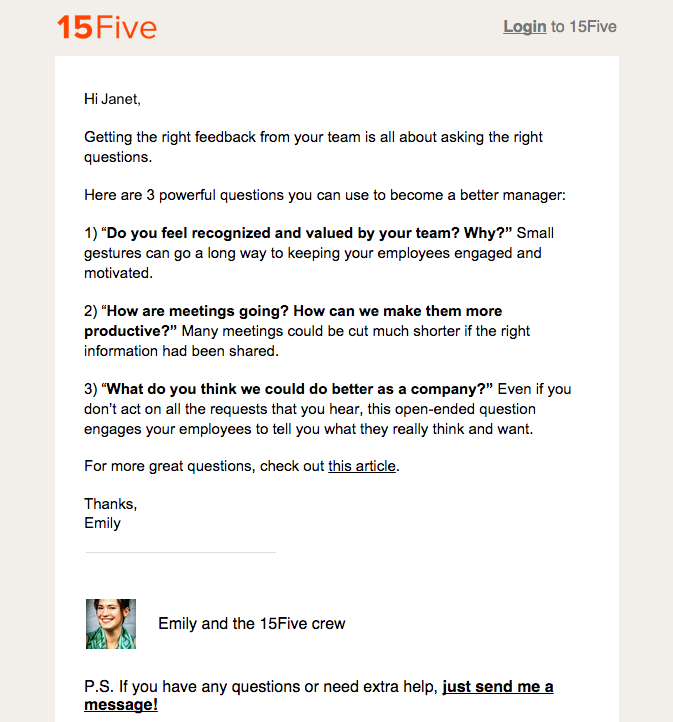 Again, you can further segment based on people’s level of engagement with your emails. For instance, you could have a reengagement series like 15Five’s but have engaged readers end up with a special offer or encouragement to sign up for your newsletter (since you can’t continue emailing trial signups forever).